The application is open until June 15, 2017. Monte Carlo simulations are among the most powerful tools for obtaining nonperturbative results in quantum field theories. They are used for a wide range of applications in particle-, nuclear-, and condensed matter physics. In these different fields of physics applications Monte Carlo techniques have seen considerable development in recent years. With new ideas, such as rewriting the systems in terms of new degrees of freedom, serious challenges were overcome, for example problems related to the sign problem. Exchanging ideas and discussing new Monte Carlo approaches used in the various communities will certainly speed up the development of the new techniques. More specifically, the central goal of the Scientific Program is to explore recent advances in Monte Carlo methods, especially those that use Monte Carlo sampling of diagrams. Topics include Dual Variables (Lattice Field Theories (LFT)), World-line Methods (LFT, Quantum Spins and Emergent Gauge Fields), Diagrammatic, Fermion Bag and Auxiliary Field Methods (Strongly Correlated Fermions, LFT, Nuclear EFT), and Tensor Networks. These methods are used and developed in the different communities. 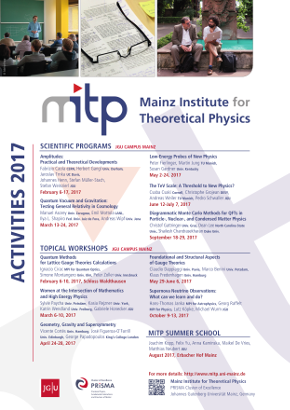 The Scientific Program will bring together particle-, nuclear-, and condensed matter physics and will allow for a systematic exchange and and comparison of the techniques.